On October 21st, Niantic Inc., the publisher of Pokémon Go, announced that they will hold the popular Community Day event again at a later date. Unexpectedly high traffic led to continuing issues in certain regions. This will be the first time that a Community Day is postponed due to server issues since the event was launched in January of this year (in July it was postponed due to torrential rains). How did user activity go compare to regular Community Days? Community Days are special events held every month on Pokémon GO. During the event period, the spawn rate of a certain Pokémon will increase, making it easier to acquire. Items and other bonuses are also given. For this Community Day, the effectiveness of Lure Modules (which are effective in attracting Pokémon) was extended from the usual 30 minutes to 3 hours. The event included plans for Pokémon Eggs to hatch four times faster, and to increase the spawn rate for Beldum (who evolves into a powerful Pokémon). However, directly prior to starting, there were stability issues with servers in the Asia/Pacific Region, including Japan. The official Twitter account posted the following information. Attention, Trainers. We apologize for gameplay issues impacting Community Day in the Asian-Pacific region. We will be holding an additional Beldum Community Day for Asia-Pacific Trainers to make up for the inconvenience. Please stay tuned as we will announce the new date soon. How did users react to this problem? 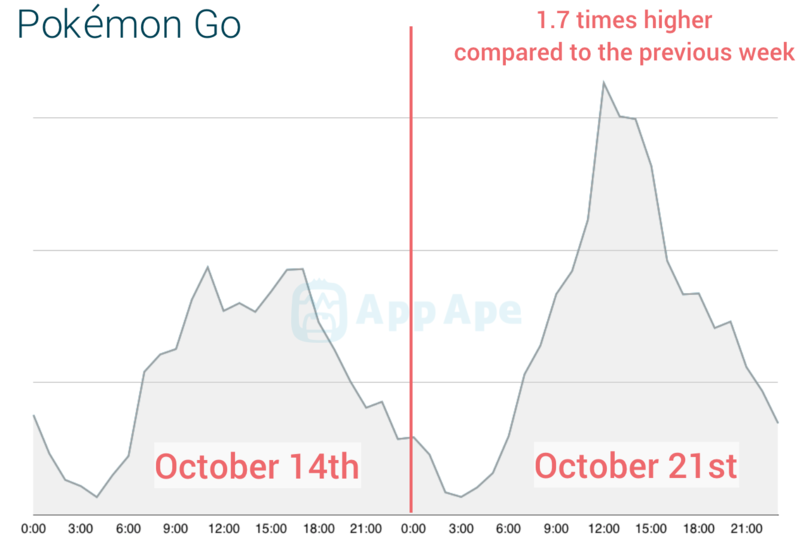 According to App Ape, an app analysis platform provided by Fuller, Inc., the app usage rate for Pokémon Go on the October 21st dramatically increased starting just before the noon when the event began. Usage was approximately 1.7 times higher than on the prior Sunday. By 2 p.m., usage had dramatically decreased. Analyzing a summary of broken-down usage logs minute by minute on the App Ape panel, usage from 11 a.m. to noon stands out when compared to the previous week. We can see that users are taking the time of the event into consideration and preparing in earnest to catch Pokémon. After 12 p.m., usage numbers continued to grow, rising to nearly twice the amount of the previous week. Users continued to use the app until around 4 p.m. We can see that they were opening the app despite the repeated server issues. Searching for # of Tweets about Pokémon Go Using Yahoo Real-time Search, the number of tweets grew once the Community Day experienced issues after launching at noon. 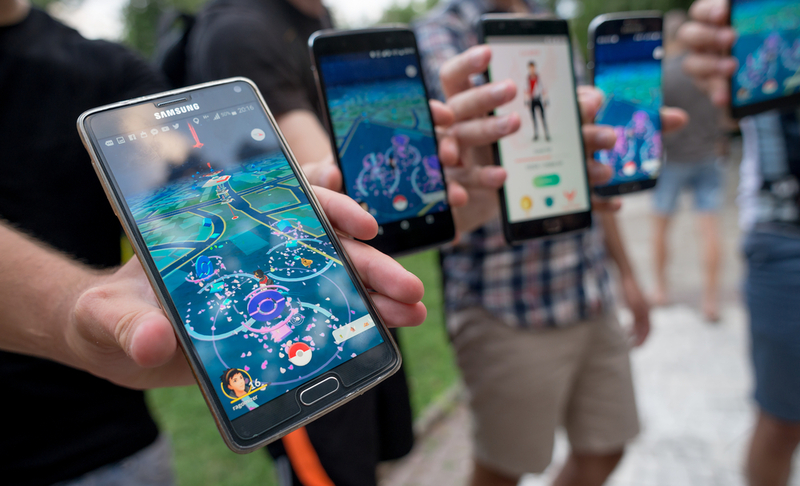 Tweets are particularly concentrated around 2 p.m.
Pokémon Go has a stable heavy user base. It has been one of the most successful games when it comes to maintaining long-term operations. Company’s reaction was fast. At 2 p.m., an announcement was made that the Community Day will be held again. Negative tweets began to decline. The issues for this event were caused by user numbers exceeding expectations, resulting in users being unable to access the app. 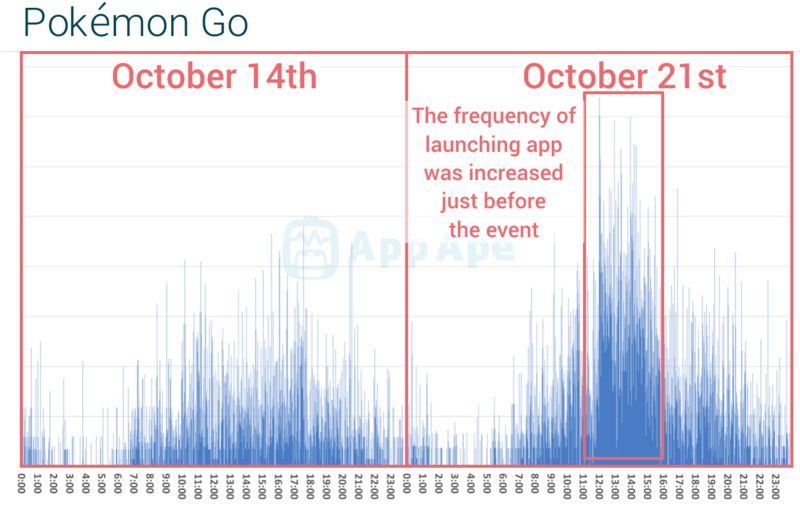 App Ape’s data confirms that app usage continued throughout the Community Day period at a rate that was two times greater than the previous week. This Community Day is planned to be held once again. What kind of user activity will we see? App Ape Lab plans to introduce the data for the next Community Day ! The data presented in this article has been collected by App Ape, a mobile app data analytical platform which is the leader of the industry in Japan with more than 5,000 clients around the globe. The various data demonstrated in this article is just a small portion of what APP Ape is capable of analyzing. App Ape, consisting of more than 50 indicators, provide detailed and accurate data usage in 7 countries. The indicators include daily, hourly active users (DAU, HAU), number of daily installs, demographics, user status and many many more.